Perfect ski-in / ski-out location. * Pets may be allowed on request. We know family time is precious and we also know that happy children make happy parents. Whatever the age from infants to teenagers we pride ourselves in being able to maximise fun for all ages. Whether in the comfort of your chalet, at play in the snow, or on the slopes with a guide or instructor your children will be extremely well cared for during their stay. All of our chalets have sledges, high chairs, cots, DVD's and games meaning there is no need to travel with bulky child equipment, our concierge team will ensure your chalet is equipped with everything you need. To make your stay as relaxing as possible, we can arrange highly qualified nannies with experience of working in alpine resorts and clientèle. Babies will be snug in the comfort of your chalet while the more adventurous young children can have all the fun in the snow; building snowmen and sledging. Working with the best ski schools in Val d'Isere we will happily advise and can arrange private or group lessons for young guests. One to one tuition, group lessons and technical classes are all available to book for children from aged 3 and upwards. Ski, boot and helmet hire can also be pre-arranged for your arrival. For children, Val d'Isere has a number of activities to enjoy off the slopes. Husky rides and ice-karting are some of our past guests favourites. The ice rink in the centre of Val d'Isere allows you to soak up the magical ambiance of the village or for those who want to make a splash, the Aquasportif centre has a fantastic leisure pool, and spa area for the adults. Good, healthy food is important for everyone of our guests including children. Children returning to the chalet following a morning skiing will be served a nutritious lunch freshly prepared by your chalet chef. High tea can be served at your chosen time and menus will be specially prepared to your children's liking. Massage & Beauty: After a hard day’s skiing what better way to relax than in one of the chalets’ outdoor hot tubs with a glass of champagne and uninterrupted views across the Manchet valley. In-resort Chauffeurs: Our in resort chauffeur service is available to you from 8am through until 2am, daily. With our immaculate collection of 4 x 4 Volkswagen Caravelles, all equipped with ski racks, our highly trained chauffeurs will be on call to pick you up and drop you off anywhere in resort. Be it collecting the kids from ski school or adults from a relaxing après ski drink in town, we guarantee you a fast, efficient and professional service. Your personal concierge:Your personal concierge service will make organising your stay at Mountain Lodges effortless. From arranging your airport transfers complete with champagne picnic, to lunch reservations at the best mountain restaurants no stone is left unturned in the build up to, and during your stay. We are always happy to deal with any special request you may have, no matter how large or small. 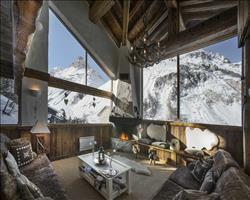 Our concierge team have great local knowledge of all the properties and Val d'Isere. With this guaranteed you can truly relax in the knowledge that your holiday has been tailor made especially for you. Travel Information: There are many different ways to reach Mountain Lodges. Scheduled flights will take you to our closest different airports with Geneva (3hrs), Lyon (3hrs) and Chambery (2hrs) being the most well serviced. The moment your plane lands your experience at Mountain Lodges begins; whether you decide to take a private transfer with a champagne picnic or take a helicopter journey over the Alps, you will be sure to arrive refreshed and ready to go. You can also reach us by rail directly from Paris to Bourg St Maurice (40mins from Val d’Isere), or from London to Bourg St Maurice on the popular snowtrain service. Should you entrust us with organising your transfer from the airport or train station, we will make sure you are treated en-route to a champagne picnic prepared by our chefs, ensuring you unwind the moment your journey up the mountain begins. For information and prices on the Transfer Service please ask a member of the team. Should you wish to minimise travel time, we can also organise helicopter transfers from your chosen airport (Geneva 30 minutes flight time). A representative will meet you from your flight and one of our in-resort chauffeurs will be waiting at the helipad in Val d'Isere to whisk you the remaining 5 minutes up to the chalet and a champagne welcome reception. Allowing you to create your own travel schedule, private jet travel is the ultimate in convenience and flexibility, while allowing you to travel in comfort and style. Limited bag restrictions, fast track security and a 20 minute check-in time all contribute to relaxed travel. For details and a quote on private jet charter please ask a member of the team. Flying is not the only way to reach Val d'Isere, if you prefer to drive we can provide you with fully comprehensive driving directions from the UK or elsewhere in Europe. On your arrival in Val d'Isere one of our chauffeurs will happily park your vehicle in one of the underground carparks and return it to you ready for your journey home. Cosy twin or double bedroom with ensuite shower room and fantastic views. A spacious double or twin room with a tiled floor, ensuite shower room and patio doors leading out onto the terrace with access to one of the hot tubs. An ideal king size double or twin. Ensuite shower room finished with Italian marble tiles. large floor to ceiling windows looking out to the Manchet Valley, direct access to the terrace and hot tub. A great master bedroom with either king size or twin beds, luxurious ensuite bathroom with bath and shower. Direct access to the terrace and hot tub with stunning views out to the Manchet Valley. Spacious room ideal as either a king size double or twin with a beautiful tiled floor, ensuite shower room and a private balcony with breath taking views. A great king size double or twin room with low beams and lots of character, ensuite bathroom with bath and shower and stunning uninterrupted views from the large windows. Dinner at Mountain Lodges is always accompanied by a superior selection of wines, especially chosen by our very own sommelier. Should you wish to personally select your wines, we also have an a la carte list of fine wines for your enjoyment. We update Chalet Mistral's details often, but facilities do change. e.g. some extras listed by the supplier as "free" or included might only be for the first time you use them, or for one time per party, then charged for further use. If any specific feature is essential to your holiday, make sure you ask us to confirm the details of it before you book your holiday. This accommodation only holiday to Chalet Mistral in Val d'Isere, France departs Sunday 28th April 2019, for a 7 night stay on a "catered chalet" board basis. A local tourist tax (Taxe de Sejour or Kurtaxe) is levied by many councils in European ski resorts. It varies by standard and type of accommodation and is age dependent, so not everyone is charged. It's not included in the basic price of your holiday and is usually paid locally. For reference, the average charged in winter 15/16 was between 50p and £2 per person, per night. Val d'Isere lift pass price last reported as €294 (adult 6 day). Ask for a quote when booking Chalet Mistral. 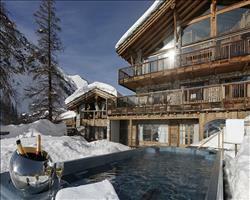 Chalet La Bergerie Val d'Isere France, Without Flights to Without Flights 28th April. Chalet Lafitenia Val d'Isere France, Without Flights to Without Flights 28th April. 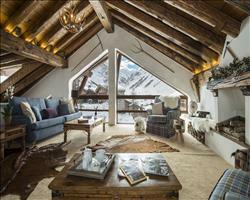 Chalet Le Chardon Val d'Isere France, Without Flights to Without Flights 28th April. 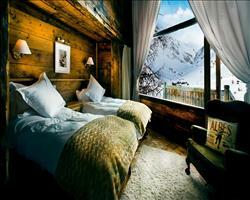 Chalet Kilimanjaro Val d'Isere France, Without Flights to Without Flights 28th April. "Thinking back, it's a surprise I made it out on to the slopes at all"